Welcome to 5 Days of Frugal Eating. 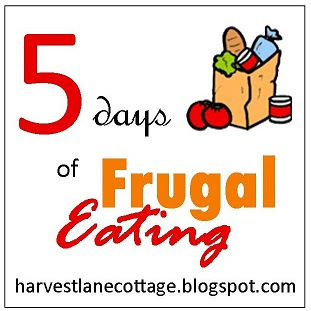 When you think of frugal eating, what do you envision? The books I've picked up often assume you can afford a lot more than I could at my lowest budget point. I needed something cheaper than thrifty cooking. I thought about calling this 5 days of Survival Cooking, but visions of bunkers of stored food or roughing it in the woods came to mind. That's not what I mean by survival cooking. To me, as a mom with four (now three) children at home, survival cooking is filling tummies for the least possible amount of money. It's not always the best nutritionally. In fact, it's carbohydrate heavy. Why? Carbs are cheap. Pasta, rice, potatoes—you get the picture. This is not meant to be a long-term way of eating. This is getting by when things are their worst until things get better. My view of frugal eating came as a result of circumstances. Because of corporate downsizing, we found ourselves in a position of lifestyle downsizing, and downsizing, and finally downsizing to a point where we were just trying to survive. During that time period, I learned to cook many things, nearly all from scratch, that kept my family from going hungry in the leanest of times. In these 5 days of Frugal Eating posts, I'll share some of the things I've done to make a small grocery budget work for our family of six. Today, I just want to give you some things to think about. 1. If your family doesn't like it or won't eat it, don't buy it. No matter how cheap it is, it's too expensive to throw out food. 2. Start a binder or list of all the foods you can make even if they're not frugal. Then highlight the frugal ones. 3. Bake. I found that if I didn't think ahead and bake bread, biscuits, etc., mealtime became super stressed as I tried to find something, anything to make the meager portions stretch. 4. Someone once told me, "Always have your hand in the next meal." She meant always be preparing ahead of time. So remember to soak the beans tonight for tomorrow's meal. Cook the rice ahead of time. That kind of thing. 5. Pray. Pray when you check what you have on hand. Pray when you make your lists. Pray while you're shopping. Invite Father God to be your shopping partner. Trust God, dear ladies. You can do this. You can do this through Christ who strengthens you. You can read the rest of the series below. Great advice to start the week! Looking forward to the rest of your posts! You can find them linked at the end of this post Kym. Thanks for the advice! It's hard to find a balance between frugal and nutritious. I can definitely relate to your suggestions and I appreciate you linking up! Very good advice! I try to do all those things on a regular basis as well. Thank you for sharing at TTF and have a great day! Boy, do I need this! Thanks for linking up at The Prudent Pantry! Well, Jes, sometimes they complain about the low carb, sugar free things I've been trying! Throw in lots of butter and sugar, and everything tastes great! I am excited and this came at a perfect time for me. You have NO idea. It is a God thing. I am looking forward to any tips shared. Thanks. Oh I'm so glad Mrs. Chrissy! You can click through the links on the bottom of the post to go to the other posts in the series. This is one that I've updated to share again. Great tips. In our early years, we followed the same advise. I have to tell you your bird song on your blog sounds so realistic that when I first heard it I thought, "Oh my! How wonderful ... the birds are returning home early. Is this a sign that spring is almost here?" Although many across the U.S. may be enter spring, up here on the Montana prairie we won't see spring until late April. The bird songs are such a welcome for this winter weary girl. Thanks for sharing them through your blog. I'm so glad you enjoy it Mrs. B. We never had winter here...quite peculiar and disappointing. I hope you have an early thaw. I love that -have you hands in the next meal. All good ideas! I fell into the trap while I was heavy couponing of buying things I didn't need or like. I could have spent the extra dollars on something we would like. I stopped that real quick. That's why I don't coupon much anymore. Fantastic tips.. I think at one time or another, we have all had to face the "lean days".. Love your tips and encouragement. ​It takes skills, but they can be learned. What great tips Laura! I always try to make things stretch anyways. I hate wasting food. I bake and cook meals from scratch 98% of the time...I have 2 kids that have sensitivities to MSG, one that can't eat peanuts or have dyes. So, to stretch the grocery bill and to keep some healthy options for my boys is a must! When food goes on sale, I stock up for those hard times. God is our provider of everything including our food budget! You are a wise woman Miss Amy! Wish we lived closer. I'd invite you over for a piece of chocolate meringue pie! Great post. I love the one about always having your hand in the next meal. So true when you live frugally! I found out real quick not to buy things we don't use even if you can buy them for hardly nothing. You could have spent those pennies on something they all like. I need to work more at keeping the hand in the next meal. Funny how, even with making 3 meals a day for years, suddenly it can be suppertime, and it surprises me! When I was feeding my children on a super tight budget, meals were most always rounded out with a homemade bread like biscuits or cornbread. There was usually a homemade dessert too. Prices are different now. Bake then, the dessert ingredients were so cheap, it truly cost just pennies to make scratch cakes or brownies. Most breads are still pretty low in cost to make but dessert ingredients seem a lot more expensive now. So glad you did this! I've certainly been in survival mode, still find myself there some of the time! Who doesn't? In '83 when I married, I had a baby shortly after, and also custody of my 3 bonus children. It was never easy, never was there enough money, so we survived on a lot of gumbo's, a lot of chili, a lot of pasta dishes with no meat. We survived! There are so many women (and men!) who are dealing with feeding families on a very short, very breakable, very limited budget! Keep these coming my friend, we all need them!!! Thanks Laurie. The rest of the series is linked in the related posts section. I was rewriting an old series. I may do an expansion of this since it seems to be a real need. I’m so glad I found this series. I’m struggling with meal times at my house! It’s bookmarked so I can read the other posts! Thank you for sharing this! I think carbs have kept many a family alive and kicking in lean times! After I moved to KS, I met a couple of ladies that told me about growing up in large families and lean times. They said potatoes and pancakes were a regular meal. And one of them said it was a HUGE deal when they had meat. And the kids would all be excited even when *the meat* turned out to be one single hot dog sliced very thinly and mixed into their potatoes. I grew up in an Hispanic family so we ate beans. Lots of beans! My grandma would put a little bit of cubed pork in them for flavor and they were delicious. She made flour tortillas every morning. I had no idea that anybody ate any different or that we were poor. The house was immaculately taken care of and I was well fed! I think if my Grandpa had sat down at the table and said, "What? Beans again? ", it might've been different, but he always smiled big at my Grandma and said, "Mmmmmm..." and he'd raise his eyebrows up and down at me and smack his lips! I adored my Grandpa and if he said it was wonderful, I knew it was! Beans were our version of potatoes!! So encouraging---thanks! Yes, I've noticed that many of the "thrifty" articles I come across are not as thrifty as I need them to be! Ha! When someone suggests ground beef as a cheap ingredient, I usually move along. Ground beef is about $5 a pound at my Walmart and we need at least 3 lbs. a meal to do much of anything with! I know! Ground beef used to be a cheap meat. No more. When I'm really short on money, I've actually walked through the store praying aloud a conversation with God about showing me what to buy. Wise words. Thanks for sharing these tips. I am transitioning into once a month shopping (except for fresh and sale items) and I am glad to read this today. So glad to be of help Gracefull. Great tips Laura! I have been there and done some of these. Thanks for sharing! Great ideas Laura! We actually had sour dough pancakes and eggs for dinner tonight. I needed to use my starter and didn't have time to bake bread today. Tasted good for a change. We don't always need a big fancy dinner! Thanks for sharing with SYC. I agree. Simple is sometimes best. For lunch, I stretched a little chicken and dumplings leftover from last night by adding extra milk and some cornstarch. No one complained. It was yummy.